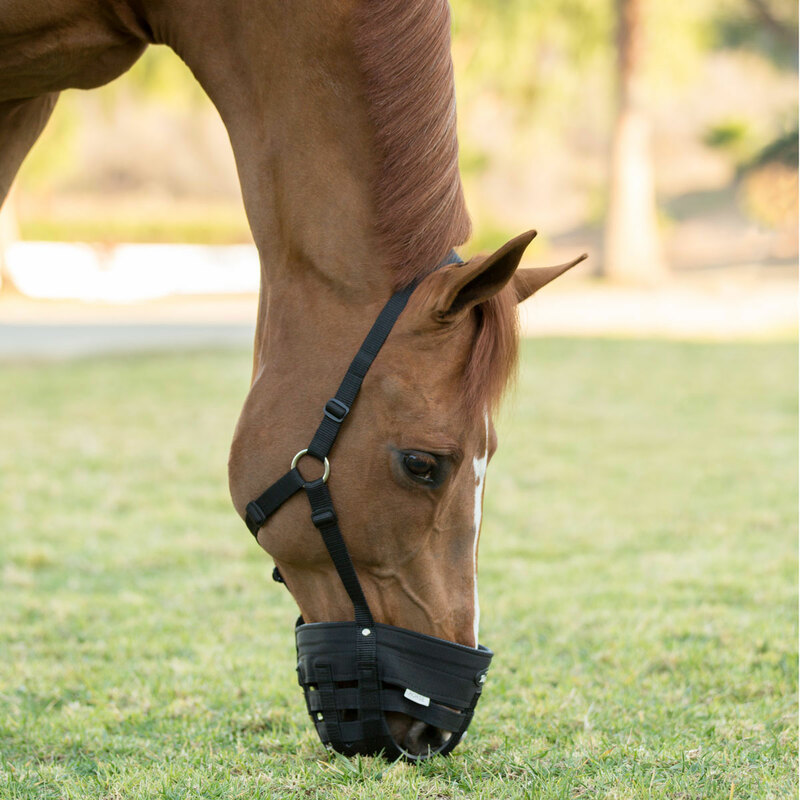 The Tough 1 Easy Breathe Grazing Muzzle is a great tool to help with weight management for the easy keeper! 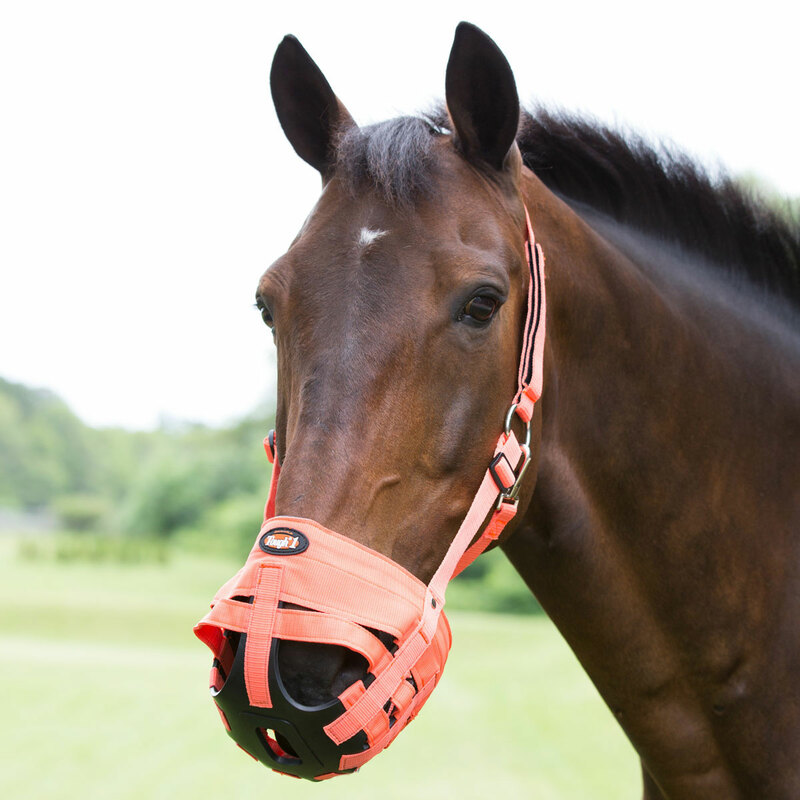 This halter has a built-in muzzle to provide a comfortable way to limit your horse's intake of grass and hay without obstructing his ability to drink or breathe. The 1” opening reduces the amount of grass and hay that your horse eats while the larger holes in the front allow for easy, comfortable breathing. Finally, it is fully adjustable for a great fit, has a breakaway feature for optimal safety, and neoprene lining to keep your horse comfortable. Muzzle Size: Large Horse size - approximately 29" in circumference and 7" deep. Horse size - approximately 28" in circumference and 6" deep. Pony size - approximately 22" in circumference 5" deep. Adjustable. Tough 1 Easy Breathe Grazing Muzzle is rated 4.1 out of 5 by 120. Rated 5 out of 5 by TFD2016 from Works great, no rubs! I have tried so many different brands of grazing muzzles for my easy keeper and this is my favorite. It is very light and has large holes to make it easier to breathe (although I did end up cutting one of the small horizontal pieces on each side to make the holes by the nose bigger). I also like how the muzzle isn’t so deep which I think helps prevent rubs. Rated 1 out of 5 by Mbfrider from Broke within one night I bought this a month ago and it finally came in this week. I put it on my non-destructive horse (she’s had the same turnout halter and blanket all 6 years I’ve owned her) last night and this morning I found it completely shredded beyond repair in the field. Don’t waste your money. Rated 5 out of 5 by Beau1234 from Good quality, comfy on horse My friend gave me the exact same muzzle so I ended up returning the one I bought from smartpak, but this is a great muzzle. It doesn’t rub and my horse is happy in it, unlike other muzzles. Rated 5 out of 5 by tinawhisp from Love it! I bought this muzzle 2 years ago for my son's pony. It has been wonderful! No rubs. Today he finally wore the rubber in the baskey thin enough to break it. I can't complain at all since it lasted 2 years. I hear friends struggle with their horses and muzzles but, I have zero complanits about my choice. Ordering another one right now!. Rated 5 out of 5 by Marie23 from LOVE this grazing muzzle! After trying several other grazing muzzles on my rather rotund pony, I bought this one on a whim . . . and I'm so happy that I did. I love the peace of mind that the breakaway provides, and the bright orange color option is FANTASTIC for when I will undoubtedly be searching for it when my horse "loses" it in the 50+ acre field! 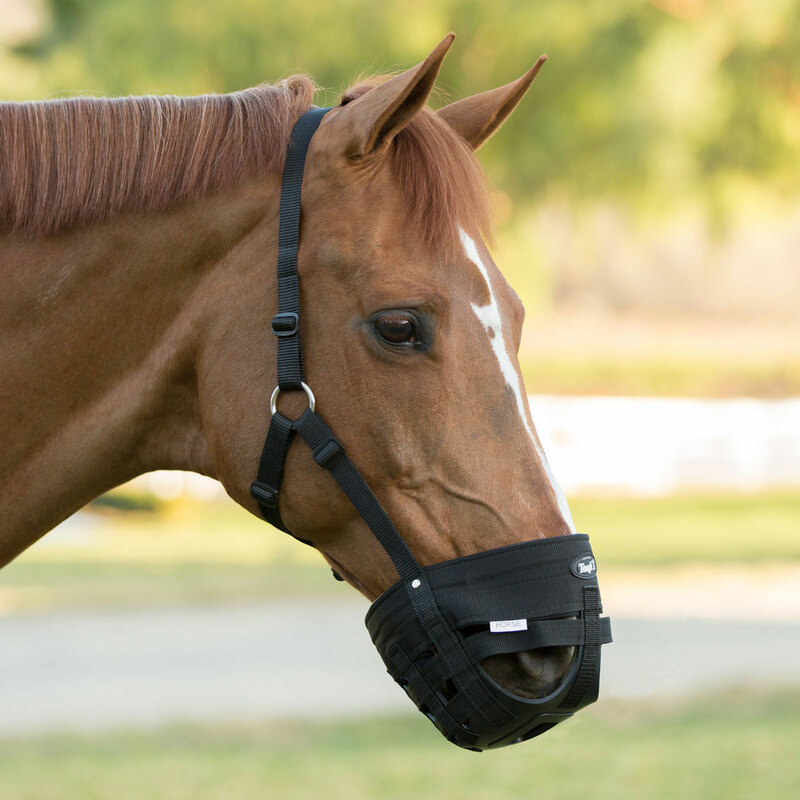 This grazing muzzle keeps him from over-indulging without restricting his breathing, drinking, etc. It was easily adjustable for his round-but-short head, so there isn't any rubbing or discomfort from an awkward size. If you are in the market for a grazing muzzle, I can't recommend this one enough! Rated 5 out of 5 by Kayce from Love this! My horse cribs terribly and we just put up a new wood fence. 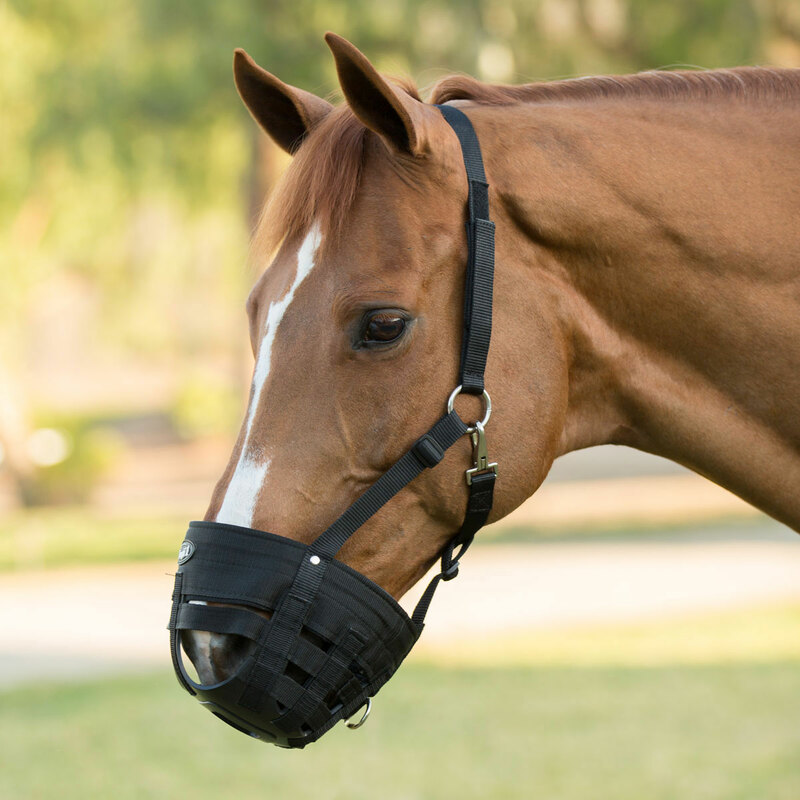 This muzzle is perfect to turn him out in because he can graze and not tear up the fence! Rated 1 out of 5 by Sweet Tea from Broke instead of releasing! My horse wears a grazing muzzle twelve hours a day, so this is not a new thing for her. I always insist on the easy breathing component and the quick release, but I wanted to try the smaller grazing opening that this one offered. On the third day of use, my mare must have stepped on the back edge. But rather than releasing at the velcro, both of the side pieces tore lose, leaving it totally destroyed. The only good thing about it was that the bright orange pieces were easy to find in the pasture! Rated 5 out of 5 by Felicity from Great muzzle! Fabulous grazing muzzle. Horses don’t love them but aren’t completely miserable like they are in another popular brand. The hole for eating at the bottom is larger so if you have a horse who absolutely can’t eat grass this probably isn’t for you. I love that they’re orange so easy to find if they ditch them (they are very adjustable and took some time to figure out how to keep them on without being too tight. ) I have dark horses so the orange tells me at a glance if they are still on. I love the larger Nostril holes. Rated 3 out of 5 by fat horse woes from good idea; not well designed As an owner of several fat horses, I have had a lot of experience with various makes of grazing muzzles. I thought this one might be an improvement because of the nostril openings. However, the openings are too low on the muzzle to meet the horse's nostrils. To make the nostril openings actually be at the nostrils, you must crank the muzzle up so high that the horse's lips stay in constant contact with the plastic base of the muzzle. Additionally the whole "basket" of the muzzle could probably use another inch of height to reduce the horse's ability to rub it off on the nearest fence post. The velcro closure on the crown piece is not really ideal for this application. The outside velcro piece is opened easily when the horse rolls and quickly becomes clogged with grass and dirt. The best feature of the muzzle is the bright orange color --easy to find when the horse leaves it somewhere in the pasture. Rated 1 out of 5 by Susan from Do not but This muzzle left raw, rub marks on my horse’s nose and cheeks. Took one week to heal. Do NOT recommend.